When I was little, I didn’t lust after coins or stamps or postcards or anything particularly, ah, collectible. Instead, I coveted tiny things. When my mother would head to torturous craft stores to pick up sewing supplies, the dollhouse aisle was a haven. Package after package boasted teensy soda bottles, itty bitty magazines (with readable headlines! ), miniature lamps, pint-sized armoires, and on and on. I always tried to pick a particularly adorable item to ask Mom for, but then I’d realize with a measure of disgust that I didn’t really know what I’d do with a set of tiny kitchen utensils. At any rate, miniatures have always had my heart. Maybe I am secretly a gnome. One sort of miniature that did frequently end up coming home with me was tea sets. 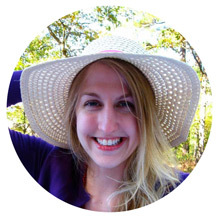 I sought them out everywhere I went — toy stores, souvenir shops, craft stores, department stores, gas stations. You’d be surprised where you can find tea sets. I had medium sets, tiny sets, super-ultra-tiny sets. There were teapots with elegant designs, cutesy designs, holiday designs, and even one where every dish was shaped like a flower. Despite my plethora of tea sets, I never once sat down and had tea. I displayed them, fiddled with them, and every now and then acted out a sad little version of a teddy bear tea party, but I don’t think a drop of tea or a crumb of a crumpet ever touched a single dish. 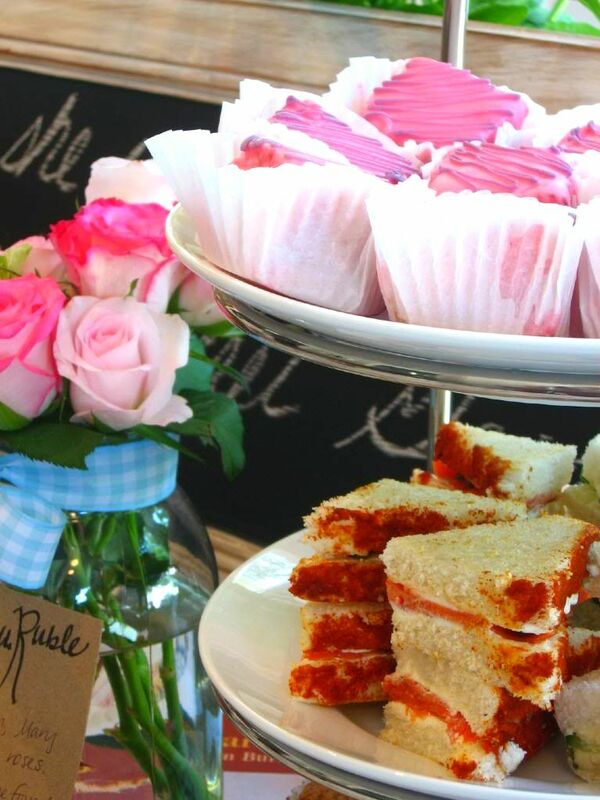 What a shame, because there are very few food events more classy and sweet than a tea party. For my sister’s Secret Garden Party, I remedied the situation. It was a tea party to the extreme, complete with a colorful tablecloth, Mom’s best china, some sweet decor, and the most important part: an elaborate spread of indulgent finger foods. These savory, delicate finger sandwiches were one of the biggest hits on the table. Place the cucumber slices in a colander, lightly salt them, and let them drain for 1-2 hours to remove some of the moisture. Combine the soft butter and garlic in a bowl and spread onto one side of each slice of bread. In a separate bowl, stir together lemon juice, olive oil, and pepper. Place the cucumber slices into this mixture and toss to coat them well. On each of 10 slices of bread, arrange overlapping cucumber slices. Top with remaining 10 slices and quarter. Serve immediately. Classic Cucumber Tea Sandwiches were cool, buttery, and satisfyingly crisp. Providing the perfect complement was the salty, bold flavor of Smoked Salmon Tea Sandwiches with a kick of paprika. Both sandwiches were devoured (daintily, of course) in between scones, croissants, and lemonade. Spread cream cheese on each slice of bread (one side only) and dot with capers (I liked quite a few capers). Arrange the smoked salmon on 10 bread slices, with a squeeze of lemon juice on each. Pepper generously (to taste), top with remaining 10 bread slices, and quarter (using a serrated knife). 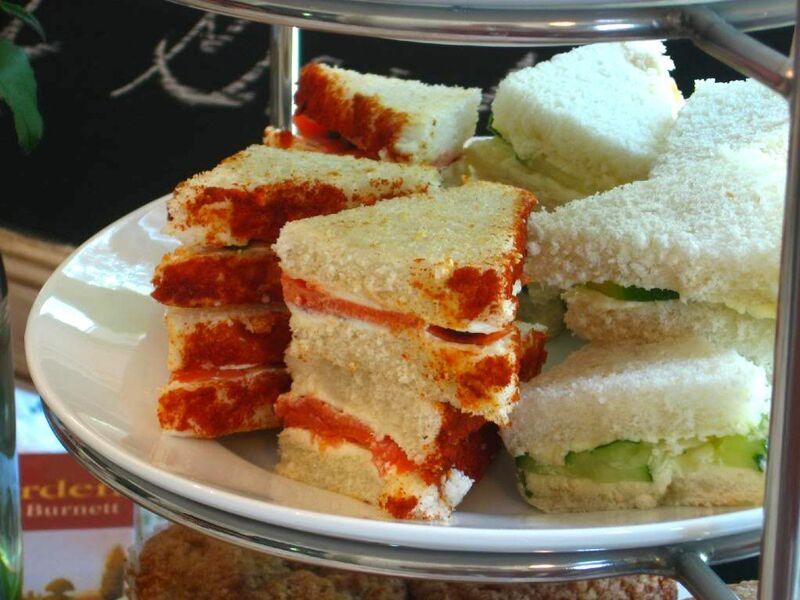 Brush long side of each tea sandwich with mayonnaise very lightly and dip into paprika to coat. Tap to remove excess paprika. Serve immediately. Don’t repeat my childhood mistake of overlooking the tea party. Whether it’s for a gardenful of guests, a roomful of family, or a handful of (conveniently disinterested) stuffed animals, whip up some of these simple tea sandwiches. With minimal kitchen time and a short ingredient list, they provide a ton of pinky-pointing deliciousness. How about you? 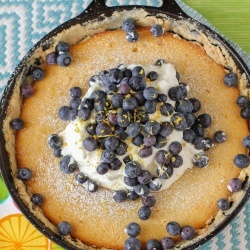 What’s your favorite tea party friendly dish? Scones, croissants, muffins, pastries, petit fours? Or are you a savory tea sandwich person yourself? ‘maybe I am secretly a gnome’ – love it! Tea is a fantastic meal and I’m so glad you wrote about it here. 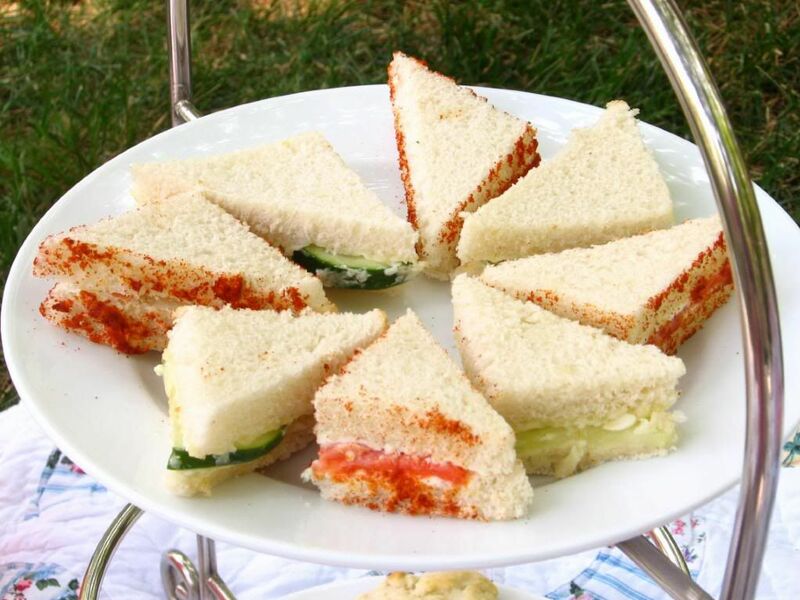 The paprika-edged sandwiches look particularly appealling. Good, tasty but dainty sandwiches would be my first choice and scones a close second. Third would be seed cake, a feature of many teas of my Mother’s generation but it seems to have fallen out of favour. Must make it soon. A Secret Garden Party sounds wonderful! Would be a terrific theme for a bridal shower. Oh, I agree! It turned out really fun and fanciful. I love things in miniature as well, especially when it comes to food! This tea party is just the cutest thing ever and we should totally bring it back! Life would be a lot better if people sat down to tea and cute little sandwiches more often. You & I were meant to be friends, Julie. I did this too when I was a kid! But, unlike you, I actually did have tea parties with my miniature sets. All the time. My fave was the Beatrix Potter one: Peter Rabbit teacup! Way to catch up on lost time, though 😉 Man. 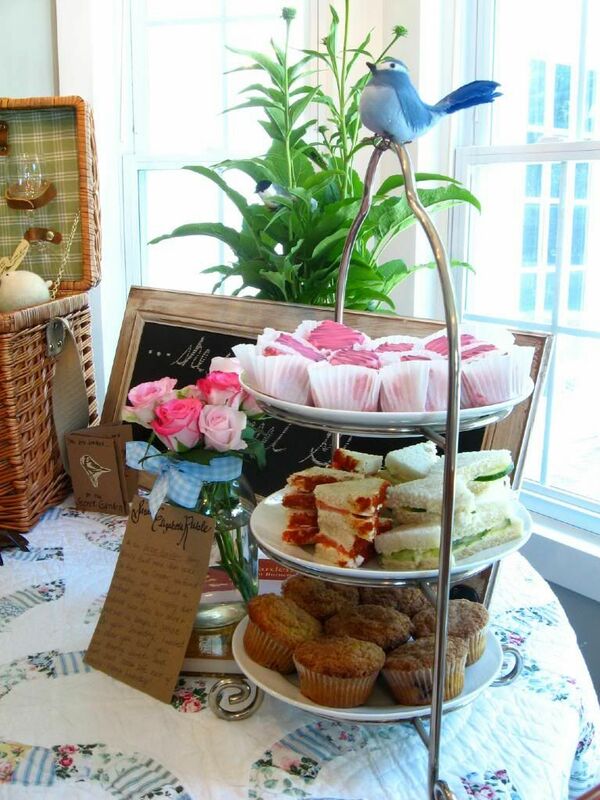 I haven’t had a tea party for yeaaars… need to get back on that! I am not kidding when I tell you that I HAD THAT BEATRIX POTTER TEA SET. We are soulmates. I absolutely adore mini things too. The sandwiches look and sound delightful. You’re making me wish it was nice enough to head outdoors for a mini picnic. We are mini twins, Megan!! Besides chai, I’ve never been much of a tea person, either. However, all the snackage at tea parties has always seemed appealing. I’ve always wanted to try a cucumber sandwich. I didn’t realize how simple they were to make – they sound wonderful! They really are! Nice and mellow and satisfying!! Thanks, Kaitlin! 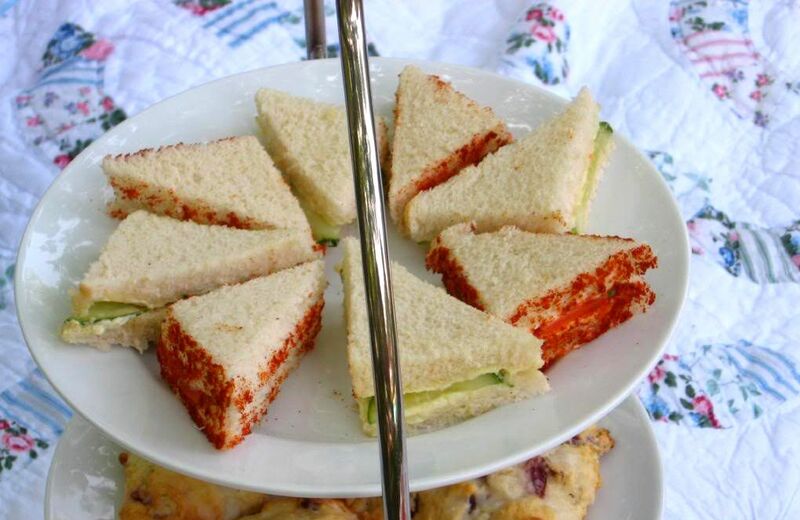 How far in advance can you make those cucumber tea sandwiches. I am hosting a fundraiser tea and would like to serve those however there will be 50 or so guests and I won’t be able to make them right before the event….can they be refrigerated fro an hour or so? Oh yes, I think an hour will be just fine. 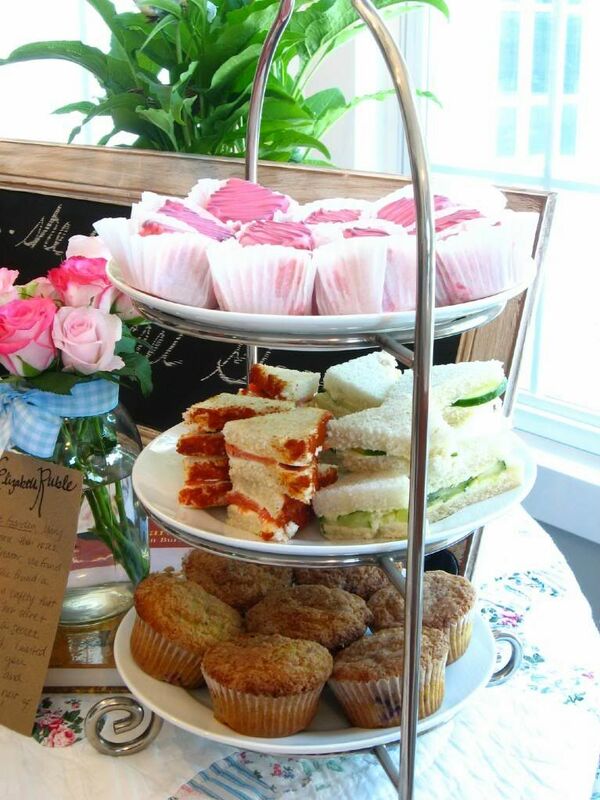 For my daughter-in-law’s bridal shower we held a high tea. A Scottish friend has an amazing collection of tea items and arranged the whole thing. We all dressed in hats and gloves and our best afternoon tea finery. It was wonderful fun. It sounds so fun, Judy! I wish someone would throw me a tea party too, Nachiketa! I remember my dad taking me for tea on Sunday afternoons and as I got older my favorite place was The Plaza in Manhattan. These sandwiches are lovely and you brought back sweet memories. Thank you! Aw, I love it, Norma!! That is so sweet! Oh I LOVE cucumber sandwiches- they’re a staple at our house in the summer, but I’ve never tried with butter & garlic! Next time, for sure! And I love the salmon/paprika ones too! How delicious! The butter and garlic (and coating them in oil) makes this great contrast to the fresh coolness of the cucumbers! I was pleasantly surprised (I’m usually not the biggest cucumber fan). My grandmother had tea parties with us, the only time we could use her real china miniature tea set. (I don’t remember what exactly we used as “tea” and “crumpets” though). HA, love it! So cute! absolutely LOVE cucumber sandwiches and your recipe looks delish. can’t wait ’til the garden bears such “fruits” again! I was nervous about the tedious process as well, but they were surprisingly quick! Thanks, Monica! Love this post! I was quite the miniature collector as a child also. Only as an adult did i discover tea is like having fancy brunch in the afternoon! Oh the smoked salmon sandwiches sound exquisite!